In chapter 1, Loida Martell-Otero highlights the key tenets of evangélica theology discussed throughout the book, noting that the Holy Spirit is essential to evangélica theology, especially the experience of the presence of the Holy Spirit in its formulation and implementation. In chapter 2, all three editors of the volume contribute on the role of the Holy Spirit. Within evangélica theology, the Holy Spirit “saves, heals, affirms, calls, empowers, and transforms persons and communities” (9). They also see the Holy Spirit impacting issues of power and justice as well as spirituality, creating “midwives to hope” (16). A second key topic is the emphasis of soteriology in evangélica theology. Explored in chapter 3 by Martell-Otero, salvation is understood as linked to Christology and experienced uniquely in evangélica theology in Scripture, testimonios (witnessing), and coritos (musical refrains). Rather than being only transcendent, salvation is found in lo cotidiano (the everyday experiences of the poor and voiceless) and grounded in experience of the Trinity. The vision of the Trinity in evangélica theology, described in chapter 4 by Zaida Maldonado Pérez, focuses on the Trinity’s role in three lived realities: la familia (family), la comunidad (community), and la presencia (God’s presence in the spaces of the everyday). In this view, the work of the Trinity moves toward a care for the other. Through this care, the concept of familia (family) is reconstituted in light of the Trinity. In chapters 5 and 6, Elizabeth Conde-Frazier focuses on the roles of Scripture and the church in evangélica theology. Chapter 5 highlights the centrality of Scripture, not because of a priori theological propositions, but because of its practical impact on lived realities, especially among the poor and voiceless. In chapter 6, Conde-Frazier describes how evangélica theology provides new models of the mission of the church by creating an incarnational focus on the actions of the church in the world through the lens of Scripture. In chapter 7, Martell-Otero argues that, in evangélica theology, the “last things” (eschatology) is understood not only in terms of time, but, more importantly, of spatiality. Chapter 8 provides an epilogue highlighting the key topics. Throughout, the book notes that evangélica theology is always teología en conjunto. This means that theology happens in relationship and partnership with others. Evangélica theology stands in a tradition with the foremothers and forefathers (the abuelitas y abuelitos) who have come before. It arises from a “praxis of accompaniment . . . from [their] experiences being part of the life of [their] communities” (5). Often, evangélica theology is a mestizaje (mixture) that arises from the synthesis of a variety of different traditions forming something new. There are many reasons to recommend this volume. 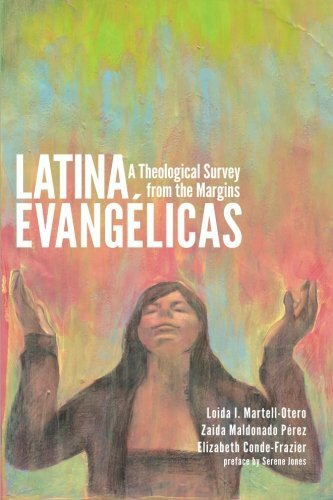 While other works have focused on Catholic Latina theologians, this book provides a welcome addition of Latina women’s voices to the usual range of evangelical theology. Through this contribution, Loida I. Martell-Otero, Zaida Maldonado Pérez, and Elizabeth Conde-Frazier remind us that Latina women comprise a part of what we call evangelicals. In Spanish, these women are “Latinas Evangelicas,” the title for this book. In the foreword, Serene Jones points out that these scholars are “planted in the soil of a community that, according to recent demographic studies, is the largest group of Protestant women in the world today” (xi). Central to the thesis of this book is the value of learning about theology from those who sit in the margins of theological discourse. The goal is not to provide a survey of all of the voices from the margins, but rather to share the unique contribution of the evangélica perspective to theology. The book’s true value is its insight into the voices of women often unheard within theological discourse. This book works toward issues of equality and justice both in terms of gender and ethnicity. Practically, it provides helpful questions throughout to encourage readers to digest and discuss this material in their respective communities. This book does have a minor weakness. While it will have universal appeal, it assumes some knowledge of languages and theological terminology. For example, without some Spanish, it may be hard understand all of what is being said in this volume. While all of the major Spanish terms are translated, at times the authors use Spanish in small ways that are not interpreted (e.g., Martell-Otero speaks of the influence of “abuelas, madres, comadres, and tias”—which loosely means “grandmothers, mothers, female friends/godmothers, and aunts,” but has the broader sense of Latina foremothers, p. 2). Also, at times, this book assumes an awareness of Latin (e.g., ecclesia reformata et semper reformada, p. 9), Hebrew, and Greek (e.g., the use of pneuma without translation on p. 15). However, much is done to try to remedy this problem by providing a glossary that not only defines, but also explains key terms in other languages within the book (139–43). Further, due to the writing style, the majority of the content is accessible to all. With a Spanish dictionary and the glossary in hand, theologians, students, and pastors can follow the book with relative ease. Latina Evangélicas is a valuable addition to the theological libraries of scholars, students, and pastors alike, providing greater insight into a growing population whose voices are a profound and necessary addition to the theological landscape.